When people ask what I’m up to and I tell them that I’m still training, my response is often met with surprise. Most people assume that I retired after Rio after winning a second consecutive Olympic gold medal. But here I am at my ninth world championships and gearing up for the Tokyo 2020 Olympic qualification process that starts in three months. I’ve thought about retirement — at times out of frustration with some nagging injuries or when training isn’t going how I’d like it to. I also sometimes felt that I should retire, not necessarily because I wanted to but because I felt like I should start figuring out what to do next. I question whether, by staying in sport, I am somehow setting myself back in my future life or second career. There are few careers that people pursue that have this imminent “deadline” when they have to essentially start back at square one to pursue a second career. Sport is one of them. Anytime I contemplated retirement and questioned why I was still training I always came back to the same thing: I love being an athlete. I love trampoline and training. I love the people in sport. I think I have more left in me, more that I can accomplish. I’ve found a career that I am passionate about and I am good at, why would I consider retiring now? Whenever I mention my desire to keep going, people automatically jump to the idea of a “three-peat.” Leading into Rio, I felt like I was managing my body, constantly weighing the balance of my body. I was coming back from a concussion that took me out of training for the better part of five months. I was trying to build back and trying to sustain/survive. Even though I was cleared to train, your brain is like a muscle, and you have to retrain it and strengthen it incrementally. It was a daily calculation of what I could do each day. I was lucky. My coach Dave Ross gave me the freedom to still work on new routines when he could have restrained me to focus on my base routine. This allowed me to love my sport again, but I didn’t fully get to train the way I wanted to. I want to train with no restraints. I want to give myself the chance to learn new skills, and new routines. A year ago, I ended my season early with this as the main objective in mind. When I came back from some time off after Rio, I was experiencing dizziness and pain. I would get one really good training session then would not be able to train for three or four days because I would feel “off”. I had tried to build back quickly to be ready for the international season. Every time I had good training, my hope would increase and I was ecstatic, but this would be quickly followed by days filled with frustration, pain, spaciness (which is terrifying when you’re flipping through the air at 25 feet), sadness, and anger. I had no idea what was happening or why, and I had no idea when it would go away. In September 2017, I pushed through and competed at a World Cup event but was unprepared and scraping by. For only the second time since 2007, I missed the final. My performance was less than ideal but my mental state was at an all-time low. When I got home, a month out from Worlds, I was unhappy, in pain, and frustrated beyond belief. I tried to push through but I hit a breaking point and, with the support of those around me, decided to end my season early and withdraw from the world championships (the only one I have missed since 2005) to set health as the No. 1 priority. A year ago, I started back at square one. First, trying to solve the puzzle of what was going on. They identified an instability in my neck and a few other things that might be contributing so we got to work. With the support and help of so many people, we built back up slowly, strategically and with the focus of long-term goals and long-term health. It wasn’t just the physical component that started back at square one, but the mental component too. I lacked confidence. I felt so fragile both mentally and physically. The only thing I was confident in was the people around me, supporting this path. Starting over again was humbling. When I seemed to be stuck, it was the people around me that pointed out my progress, even when I couldn’t see it. I was getting stronger and my movement was more functional. I was going days, then weeks without spaciness and pain. When I got back on the trampoline, beginning the progress seemed painfully slow. All I saw was how far I had to go, and not how far I had come. Through this process, I often questioned why I was choosing this path but always came back to the love of sport and the focus on health. I started competing again in April with easier routines and feeling quite unprepared. I had never felt so nervous in competition and felt unable to manage my nerves. 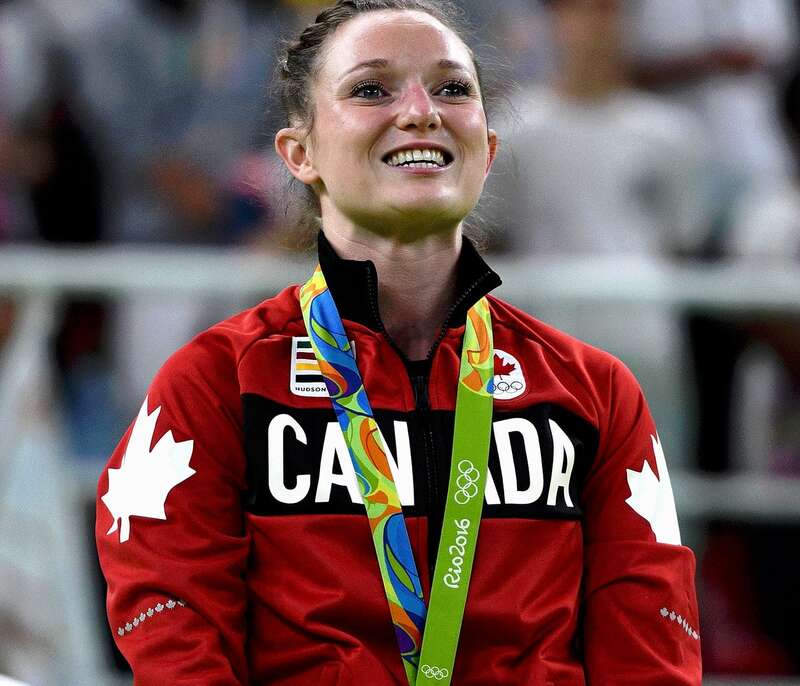 While I knew that I was making progress, I struggled in competition, not getting results that I wanted (at one point, I even lost my position on the national team) but I was also inspired by the athletes around me, especially the Canadian women who are pushing themselves to be better. Watching them train and compete constantly reignited my passion and motivation. Bit by bit, with a lot of help (and a lot of patience, which is not my strong suit), I improved. I got back to competition, back on to the national team and back to competing routines at the level of difficulty I was before. Slowly, my confidence grew. As I became more consistent in training, I started to believe in myself again. I even got back on the podium at the final World Cup of the season earning a score higher than what I scored in Rio, reinforcing that the tough decision to take a temporary step back was necessary in pushing forward. Now, I’m excited to train, excited to be in the gym and excited about the girls we have on the national team. All of this has lead me here, to Russia, to compete at my ninth world championships in individual and synchronized trampoline with my teammate Sarah Milette. I’m excited and I’m nervous. I have no idea what is in store for me this week but what I do know is that I am confident in the progress I have made this past year and am excited for what’s to come. I am stoked to be representing Canada this week, alongside some amazingly talented, hard-working, and driven athletes. Whatever happens this week, I know I’m on the right track. When asked for advice, I always use the words of a pro climber, “chase the dream, love the journey.” Medals and results cannot be the driving force behind an athlete. While I set goals for competitions and am constantly striving for top performances, working with my coach to determine what it will take to be at the top, the main purpose that drives me is passion for the sport, competing and striving for excellence on my own terms. I focus on, and love, the day-in, day-out grind and the lessons that sport can teach you because that is what will serve you, both on the competition floor and in whatever you pursue next.